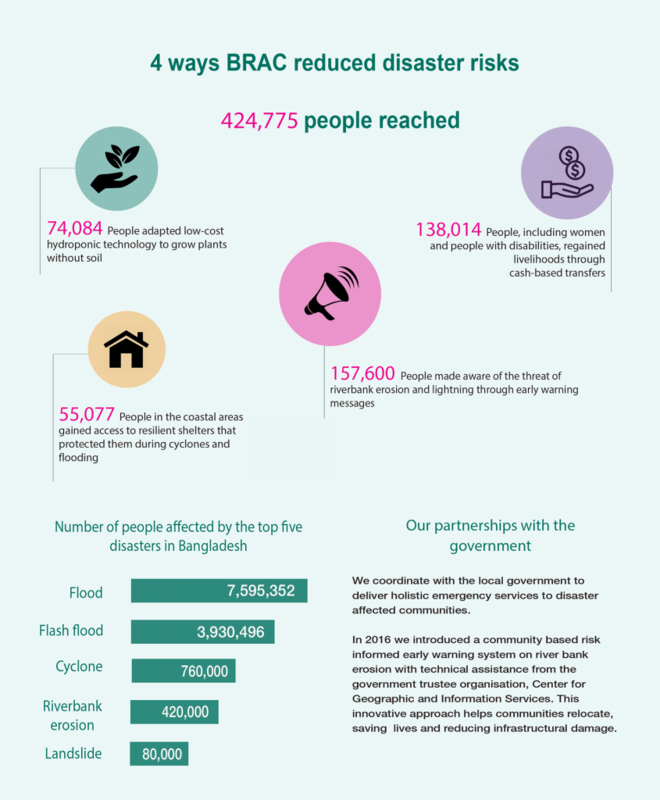 More than 80% of the population in Bangladesh are potentially exposed to floods, earthquakes and droughts – and this is mostly because of a lack of vital information on early warnings and disaster preparedness. Strengthening resilience of those most vulnerable to the impacts of disasters is a top priority for BRAC, and the impacts of our disaster mitigation initiatives have been clear. A potential fodder crisis was curbed through the introduction of hydroponic green wheat grass technology. Thanks to the method of growing plants using mineral nutrient solutions in water instead of soil, farmers found a crucial alternative for their livestock when the floodwaters came in. Producers also saw a new window to income generation. 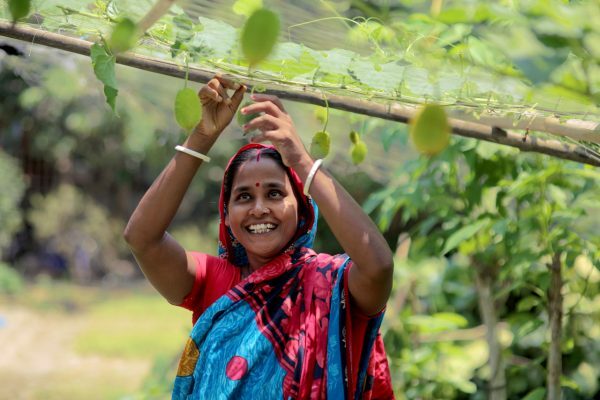 In the aftermath of the 2017 flash floods in the haors, this low-cost technology supported 612 women entrepreneurs and marginal farmers to be economically resilient. Women and people with disabilities are disproportionately affected by disasters, and need special assistance to recover from the shocks. With inclusive financial services like cashless transfers and cash for work initiatives, these communities regain confidence by being able to reconstruct houses, improve health and WASH facilities and send their children back to school. We empower selected female groups in the community to administer the funds as per need. 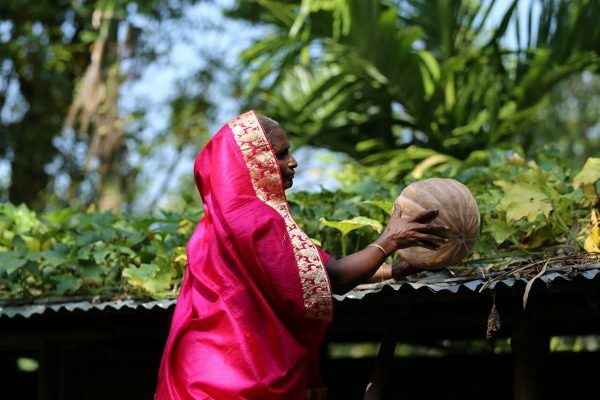 These instant cash services collectively enhance the community’s livelihood resilience. 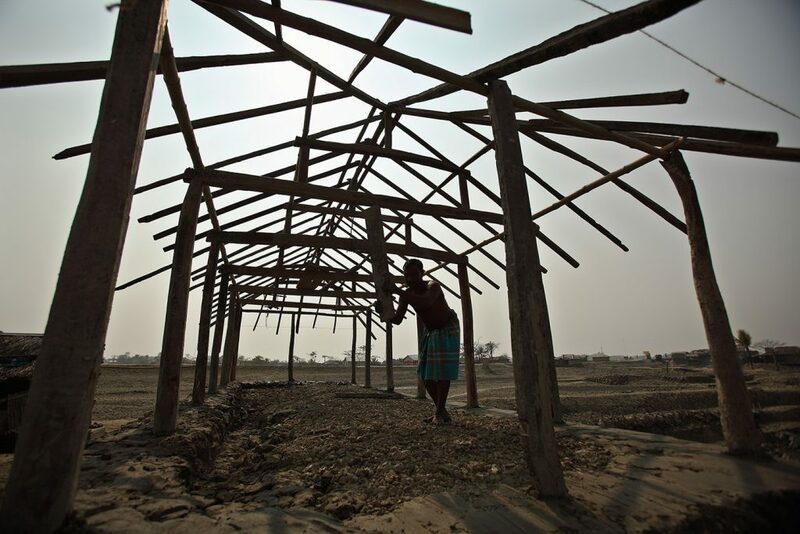 Housing structures in disaster-prone areas need to be weather-resistant, using cost-effective materials that are locally available. We used local insights and developed a resilient housing model that withstands storm surges. Using environmentally friendly and low-cost materials such as corrugated tin, plinths made from brick, cement pillars and ropes, the structures are made resistant to weathering effects. The development of these structures vary according to the weather patterns of the particular regions. In the face of natural calamities, preparedness is the key. Knowledge of early warning signs can not only minimise the damages incurred, but also save lives. It helps vulnerable communities relocate in the least possible time, preparing them beforehand to face the aftermath of disasters. Quick access to critical early warning messages also reduce local government expenditure on community infrastructure. This initiative prompts authorities to act ahead in protecting local and communal structures from significant damage. In alignment with the Sendai Framework, and SDGs 11 and 13, ensuring effective integration of disaster risk reduction efforts in crisis situations is paramount. 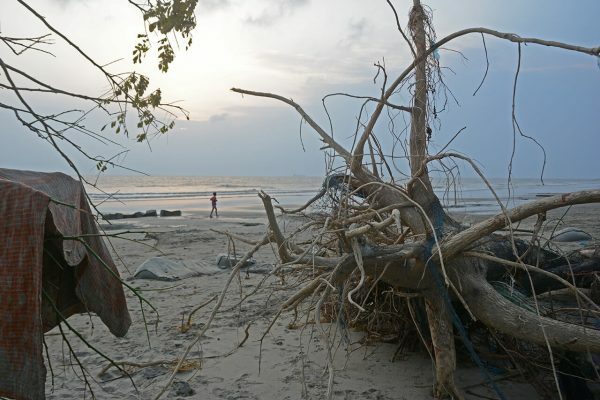 Bangladesh is increasingly affected by climate change. Not only are we surrounded by water bodies, but we are also heavily dependent on agriculture. Aligned with BRAC’s goal to becoming a leading entity in humanitarian response, these initiatives ensure effective integration of disaster risk reduction in crisis situations. By prioritising those who are most at risk, we are preparing communities to tackle the aftermath of disasters head on. Arefeen Ahmed is deputy manager of donor reporting and communications at BRAC’s disaster management and climate change programme.